Honeycomb is our low cost solution for archiving data. We wanted something that was easy to use and has easy to understand billing. Your client software cannot see the files - which means the client software cannot delete them either accidentally or maliciously. Honeycomb files have a minimum expiry date - which means users cannot delete them either accidentally or maliciously. Honeycomb works slightly differently depending on what is being archived. Data is copied into Honeycomb and files can be restored directly from Honeycomb. It is a requirement that you setup GFS (Grandfather-Father-Son) on your Veeam Backup Copy Job to have at least 1 copy. However when you enable Honeycomb for this user the actual number that you specify to keep will not be determined by Veeam, it will be determined by Honeycomb in Control. This is to stop unauthorised deletion of backups. After GFS has been set, Veeam will trigger a standalone restore point to be created on our side which is not part of your backup chain. Honeycomb's VTL Automation then finds this restore point and sticks it in the archive, removing it from Hyperformance storage. 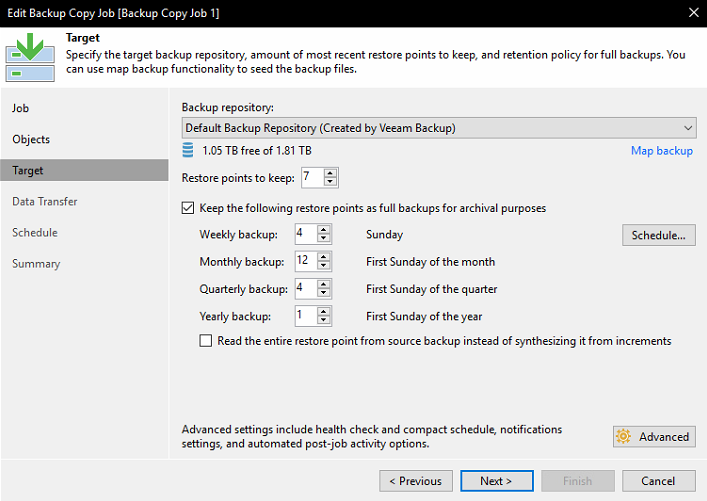 The number of restore points that you set in Control will apply to all Veeam Backup Copy jobs. For example, if you have two Veeam jobs replicating to us, and you set Honeycomb to keep 4 weekly restore points, then you will have a total of 8 files (2 jobs x 4 restore points). To get a restore point out of Honeycomb, click Restore and the specified data will be copied into Hyperformance where it can be accessed by Veeam. You may need to rescan the Cloud Repository from the local side to see the file.